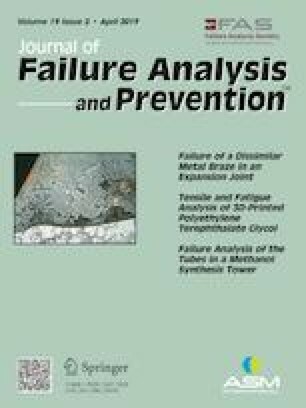 The analysis of a failed elbow in a methanol synthesis tower is presented in this work. In order to examine the causes of failure, various techniques including visual inspection, optical microscopy, scanning electron microscopy, energy-dispersive x-ray spectroscopy and a tensile test were carried out. The investigation results suggested that failure occurred due to stress corrosion cracking. The low content of molybdenum in this failed tube caused the decrease in pitting corrosion resistance. At the same time, an intergranular corrosion morphology was present in the inner wall of the tube, which was mainly caused by the sulfur present in the scale layer. Chlorine was also detected in the cracks. Moreover, the residual stress was inevitable in the vicinity of the weld due to the repair welding. In addition, the tensile test showed that the elongation of the material was lower than the relevant standards. Therefore, premature cracks initiated in the inner wall of the elbow, and then propagated along the thickness direction and also along the circumferential direction that led to final failure under the combined action of the above factors. The authors gratefully appreciate the support of National Natural Science Foundation (No. 51275172), Science and Technology Commission of Shanghai Municipality Project (No. 14DZ2261205), Aviation funding (2013ZFS7001) and Shanghai Pujiang Program (15PJD009).